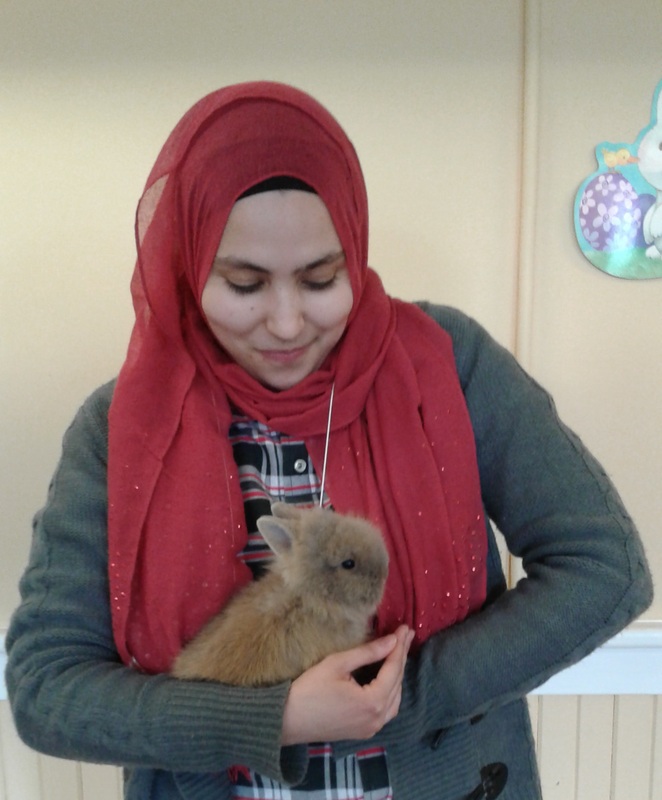 Manel Zeghal holds a rabbit at the Canada Agriculture and Food Museum. In honour of National Volunteer Week – April 15 to 21 – Ingenium is putting the spotlight on just a few of its invaluable volunteers. In today’s profile, the Channel highlights Manel Zeghal – who currently volunteers with the Canada Agriculture and Food Musuem. The first time I read this quote, I was unsure of what it meant to make a better world. Did it mean being in a position of authority, or being in the newspaper? I commonly felt disheartened at the troubles within the world and desperately wanted to “make a difference,” but I was skeptical of how much good a young person like me could possibly do. My epiphany came in the form of my volunteer work during high school. In order to graduate from an Ontario Secondary School, every student must complete a minimum of 40 hours of community involvement activities. As a ‘minor niner’ (Grade 9 student), I heard a few horror stories about senior students struggling to secure enough hours to graduate. As a result, I decided to start early on – and finish off my hours as soon as possible – so I wouldn’t have to worry about them later on. While searching for volunteer opportunities, I came across a posting to volunteer at the Canada Science and Technology Museum, specifically by making arts and crafts with visitors. One of the best things about growing up in Ottawa was the frequent trips to the national museums. I had such fond memories of visiting the museum – such as the Crazy Kitchen, the locomotives, and the fibre optic light tunnels – so I wanted to share that with others. Moreover, I always enjoyed interacting with kids, and as for arts and crafts, let’s just say I never missed an Art Attack episode. All in all, I couldn’t think of a more enjoyable place to volunteer! Since it was a couple of days before Halloween, I decided to use my creativity skills and make a conductor’s hat, with the crown shaped like a pumpkin. Slowly, the young girl began to join me, and started to help make the hat by cutting out scary jack-o-lantern eyes. It was at that moment, quite unexpectedly, that I realized that I was making a positive contribution. I was so caught up expecting this contribution to be measured in thousands of dollars, or tens of news articles. I finally saw my positive contribution through the smile of a parent, thanking me for all my efforts in helping make their child’s trip to the museum a memorable one. From that day onwards, I’ve continued to volunteer with the Canada Science and Technology Museum, as well as the Canada Aviation and Space Museum and the Canada Agriculture and Food Museum. From summer camps to special events activities, I completed my 40 hours (and then some!) and continued to volunteer throughout my undergraduate studies. Having completed an Honours BSc degree in Biomedical Sciences, and currently pursuing a Masters in Microbiology and Immunology, volunteering at those three museums and being exposed to all those exhibits helped me realize that there are no limits to scientific ideas and new discoveries. As such, I decided to continue in science. To this day, I believe that being a volunteer is more than just an opportunity to me; it is part of a lifestyle in and of itself which we should continuously strive for. I believe everyone should actively search for opportunities to help improve oneself and our community; I think everyone could use a jack-o-lantern train conductor’s hat.